International job roles require a slightly different CV format to a standard role. Unless you've been working for an international organisation for years, you probably won't have any direct experience, so you'll have to show transferable experience from your past roles. This means making good use of the intro (profile, personal statement or objective) which can very quickly show a HR manager glancing through a stack of CVs why you're right for the position. We're going to take a look at a fantastic example of an international CV that comes from another website and how it is different from a standard application. The CV is on the right. 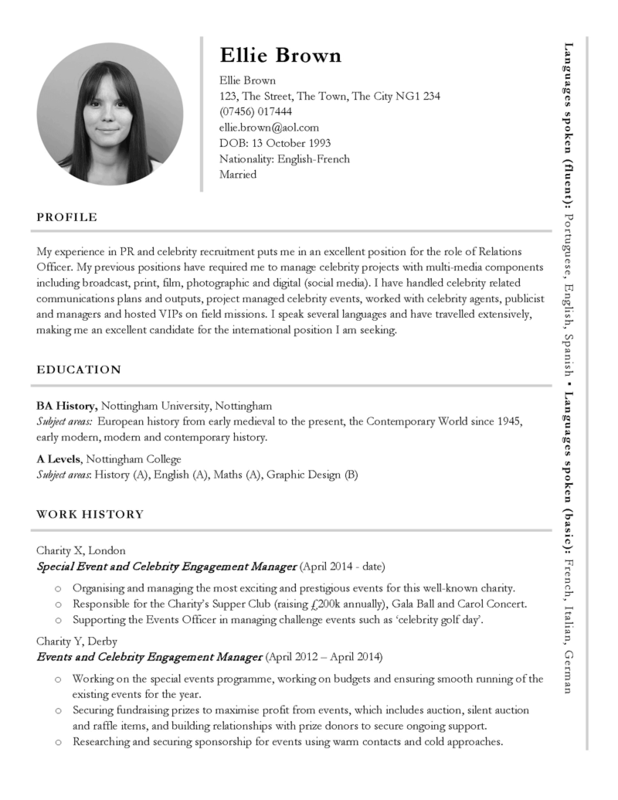 First, you'll see that the profile very clearly spells out how the candidate's previous experience is relevant to the role. She's worked in PR and this type of experience is going to be highly transferable to an ambassador position. Then you'll notice how the education section follows the profile. On a UK CV this would be different, but it's more common in other countries such as the US. The candidate here has picked out a few details from her course that are relevant to the position (i.e. her knowledge of European history) for added credit. The next point to note is that the candidate has a relatively short employment history but she's focused here on how she's completed work relevant to the job she's applying for. Next, in the skills section, the candidate has explained HOW she has acquired the skills she wants to demonstrate, rather than just listing them. This is really important as anyone can just list off skills, without giving examples. She's picked out four key skills here - you wouldn't need to list every requirement of the job, as some skills would be demonstrated through your work history, education or even interests. The candidate has included some memberships on this CV although it won't always be appropriate to do so. You'd only include memberships that were relevant to the role. A relevant membership would be one that shows an interest in a profession or sector that relates closely to the role. Next, you'll see that the candidate has included some interests. This helps the HR manager build a picture of what she is like as a person. It can also send other messages - for example, that she's happy working in groups, enjoys socialising and networking, and likes to stay in shape. Of course, these signals are taken from healthy hobbies and so, they will be perceived in the candidate's favour. If instead she had written 'drinking and socialising', the prospective employer would immediately wonder about hangovers and sick days. Finally, this candidate has chosen to include their current employer as a reference. Not all candidates are happy to do this. If you haven't told your current employer that you're leaving, you might instead want to put 'references available on request' in this part of your CV. The CV template has a couple of other nice features including languages down the side and space for some additional text (such as secondary skills). There's also room at the bottom for a couple of quotations which might come from past employers - or these could be traded to make space for some achievements. 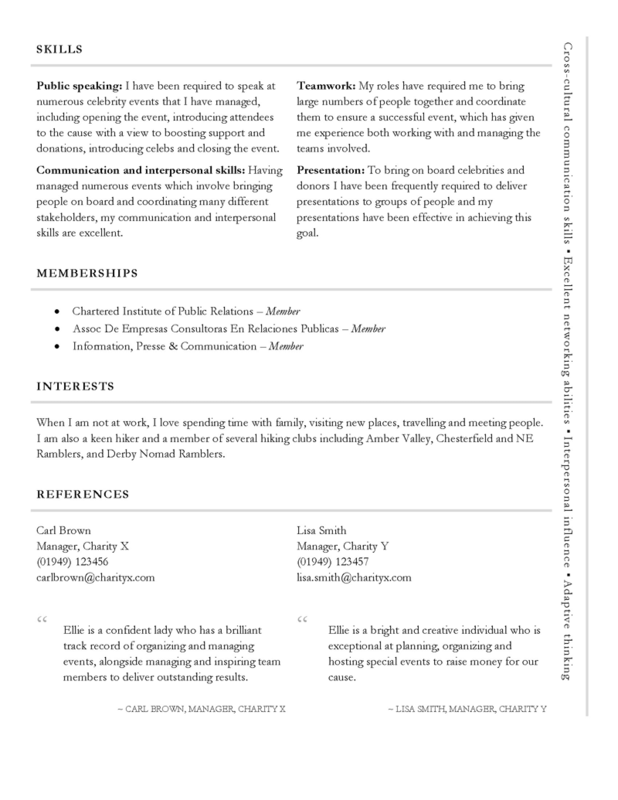 You can download this awesome international CV template here for free. Consider translating the finished CV to another language if you're sending off your application abroad. According to the UN Charter and personnel policies of other IOs, the primary consideration in the selection of staff is the need to secure the highest standards of efficiency, competence, and integrity. We aim to assist applications with locating international job vacancies and applying, successfully, for those vacancies.